Most of us are more rebellious in our teens and twenties only to become more conservative as we grow older. This is the natural order of things, evolutionists would say its simply motivated by self interest. When someone has their whole life ahead of them it makes sense to use their energies in a way which they believe will improve their own future. When they are older they have less of a future, their identification is with the past and they naturally want to hold onto that and confirm it. Some people continue to be rebellious, it may be that their issues alter with age, but you can guarantee that they will stand against the conventional viewpoint until they die. But for a few, these changes with age are much more extreme, they are utterly radical in their youth and become real reactionaries as they get older. In astrology there are two planets that are symbolic of revolution, Uranus and Pluto, but they both come at it from different perspectives. Uranus is the political rebel, people with this planet emphasised do genuinely want change and are usually motivated by an idealism of equality and freedom. Pluto is revolution for its own sake, people who have it prominent just want the past destroyed in order for a completely new start, it doesn’t really matter whether this brave new world is part of politically broader future. Pluto people have to go through deep transformation and reinvention, its the intensity of the process that matters not necessarily the result. As long as they are moving in an utterly new direction it’s not important whether its progressive or reactionary. One very obvious example of a Pluto person was Eldridge Cleaver, an Afro-American militant black activist of the ’60s, leader of the Black Panther movement and a cult figure who joined the Moral Majority in the ’80s and supported Reagan. If we look at the chart in terms of the signs, Cleaver would not come over as a radical. If we checked the charts of everyone appearing on protest marches the Sun in Virgo, Moon in Libra and Cancer rising is not a combination that would appear often. But if there’s one thing that 40 years of astrology research has taught, its that there is too much emphasis on the signs in general. Its true they give a fair understanding of basic character but if you want to understand a person’s life there has to be more focus on planetary aspects. In Eldridge Cleaver’s chart, by far the most significant one is Pluto’s close conjunction to the Ascendant. This insists that whatever the person’s basic character, they will go through enormous personal transformation. In this case, Cleaver’s stellium in Virgo, early Libra is not so much an indication of character as a series of planets that Pluto would transit at a certain time in his life. The Sun is conjunct Neptune and opposite Saturn, an aspect that instantly suggests isolation and restraint. Pluto transited this group between 1959 and 65, and it would mark the most intense and powerful personal transformation. in the late 50s, Eldridge Cleaver raped an unknown number of women, both black and white. He felt that his rapes of white women were “insurrectionary” rapes, justified by what African Americans had suffered under a system dominated by whites. Pluto then went on to conjunct Venus between 1966 and 68. Cleaver was granted parole in 1966. He met Huey Newton February 1967, and along with Newton became a leader in the Black Panther movement, a major figure in redirecting blacks away from Martin Luther King’s ideal of assimilation toward more radical aims. “Soul on Ice” was published in 1968 and gained immediate recognition. In April 1968, Cleaver was involved in a shoot-out with police that left a fellow Black Panther dead. At first jailed, he was soon released on bail, which allowed him to continue his run for president on the Peace and Freedom Party ticket. However, Cleaver was then told he would have to return to custody. Rather than go back to prison, Cleaver fled to Cuba. During his time as a fugitive, he visited North Korea, North Vietnam, the Soviet Union, and China. Cleaver also travelled to Algeria, where he set up an international office for the Black Panthers before being kicked out of the group in 1971. Just as Pluto’s conjunction with his Sun radicalised Eldridge Cleaver, its conjunction with his Moon between 1971 and 73, brought about a totally different but equally profound transformation. He moved to France where he had a religious experience and then voluntarily returned to the U.S. in November 1973 and gave himself up to arrest. He then proclaimed himself a born-again Christian, decried the socialist systems he had seen and wrote that “the American political system is the freest and most democratic in the world.” Cleaver’s charges from the shoot-out in 1968 were eventually reduced to assault and he was sentenced to community service. Between 1980 and 83 Pluto recreated its relationship with the Ascendant by square aspect. In the early 1980s, he joined the Republican Party and endorsed Ronald Reagan in his 1984 presidential reelection campaign. But in 1985 – 6, Pluto made an opposition to the rebellious Uranus and in the mid-1980s, Cleaver became addicted to crack cocaine, which led to new brushes with the law. He was placed on probation in 1988 after convictions for burglary and cocaine possession. In 1998, Pluto made the second aspect of Cleaver’s life to his Sun. He died at 62, probably of diabetes, in May 1998. 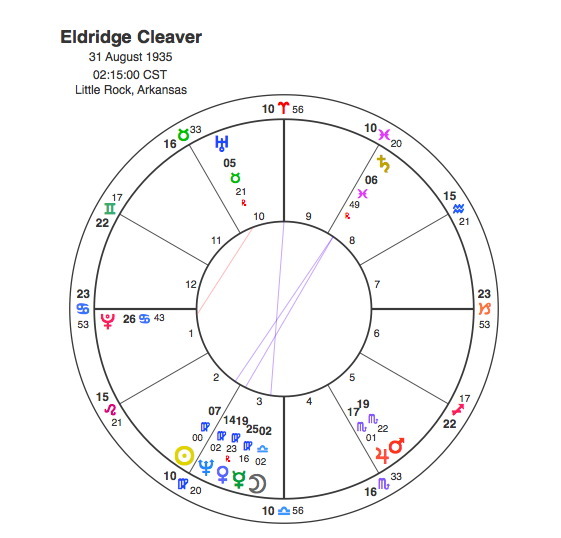 As the Black Panther who changed his spots, Eldridge Cleaver proved one thing in his extraordinary life, if you’ve got Pluto rising, it doesn’t really matter what sign you are.